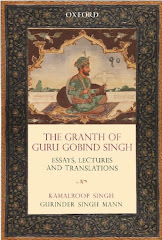 The traditional view about the Sri Dasam Granth Sahib –‘The Global Vision of Guru Gobind Singh that is’. By Gurinder Singh Mann & Kamalroop Singh, UK, February 2012. This tukh from the Sikh nitnem always hits hard, it resounds in my mind at the crescendo of the prayer. It always resonates deeply, and it seems to that the Guru intended this to be the case. He emphasizes that true love is the only way for mankind’s emancipation. Without love and passion in our prayer, simran and seva, it is just empty ritual. In the words of the Sufis, it is love that is the Divine wine that fills up the cup. This verse by Guru Gobind Singh daily reveals to us the ultimate truth, and is specifically in the third nitnem bani the Tav-Prasad Svaiye, which is a part of the longer Sri Akal Ustati. In the rest of the composition he reiterates that without bhavana or heartfelt devotion all religious rituals, however elaborate and splendid, are nothing but mere illusions. What is surprising is that a composition that shows the universal nature of Sikh Dharam is now subject to a constant barrage of doubts and criticisms.